Time to reveal the card redeemable for the 2012 Topps Finest Baseball Autograph Rookie Redemption # 4. 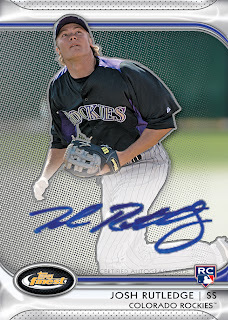 It is Josh Rutledge of the Colorado Rockies. Rutledge, the starting shortstop for the Rockies, is currently batting .327 with 7 home runs in 47 games. There is only one more player to announce, for card #5, and that should come some time next week. Stay tuned for the last Finest Autographed Rookie Redemption announcement.